– There are three slots built into the iceberg for the included ice cores. These can be bored out of the iceberg using the auger. - The auger is operated using the rotary button on the side. - The handy rescue sled is used to transport the tool and extracted ice cores. - Two skis are included for each of the included Arctic Explorer figures. - The heads and legs of both Polar Bear figures move, as does the bottom jaw of the large Polar Bear. Price is 28% below the initial Playmobil retail price, a € 6.09 discount! The Arctic Explorers with Polar Bears (9056) Playmobil set is available from the sites below. However, they do not offer delivery to your selected region. 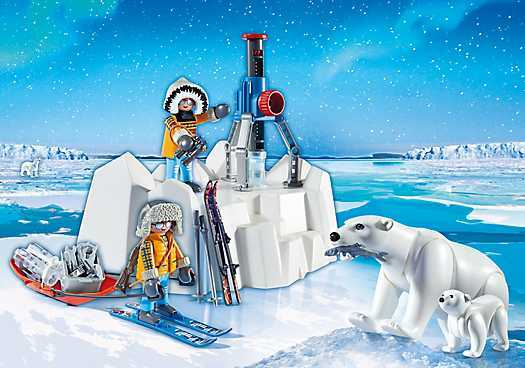 The Arctic Explorers with Polar Bears (9056) Playmobil set is no longer directly available from the sites below. However, 3rd party partners of these sites might still have the set available. Alternate description and functional ice auger.